Ignorers: A common species, ignorers are easily spotted as they are the people who appear to be wearing invisible cervical collars around their neck. It’s incredible how easy it is to tell when someone is trying very, very hard to avoid even the slightest bit of eye contact with you as they drive by. I could have been standing there wearing a chicken suit and juggling flaming chainsaws and it wouldn’t make a difference. Avoiders: Avoiders are by far the most egregious offenders. These are the people that either dramatically accelerate (despite the approaching sharp bend in the road, which necessitated a speed reduction on the part of sane drivers) or abruptly move into the lane farthest away from me as they pass me by (a lane that, I might add, ended 30 yards down the road, thus forcing them to almost immediately return to the lane that had just passed dangerously close to me and my sign). It was as if they thought I was going to brazenly launch myself onto their vehicle and cling precariously to the roof a la James Bond until they let me inside. I call shenanigans. Squinters: This group made me want to put my head through the speed limit sign I was standing next to. Fortunately, they are easy to identify ahead of time allowing you to avert your gaze until the danger has passed. An experienced squinter will, beginning at least 50 yards away, hunch over the steering wheel and intently stare at your sign feigning a lack of comprehension. They will continue to intently stare at your sign, as if expecting it to do a magic trick, until they have passed you. “Whoops, wasn’t able to read that until it was too late. Guess we’re not picking him up.” Seriously folks, there’s one word on the sign and it’s in like size-250 font. Don’t pretend you can’t read it. Nodders: Nodders own the road, or at least they think the do. To them, you standing there with your backpack and little sign are doing nothing but besmirching the good name of the road they are driving on. They love to give you disapproving glares or stern little head-nods in an attempt to communicate this fact to you. Demographically, nodders tended to be older drivers, an age group on which my hopes rested on the albeit small chance that, maybe, just maybe, I would bear a striking resemblance to some little old lady’s grandson, prompting them to experience enough compassion to pull over. As you have probably guessed, this was not the case. Wavers: Most truckers fall into this category, but a lot of other people do as well. Wavers always make the deliberate effort to give you a thumbs up, a smile, or flash you a peace sign in order to show that, obviously, they sympathize with your plight hope you get a ride super soon. However, they are far to worried about getting burglarized or brutally murdered to actually pick you up. Hypocrites. Anyhoo, just as I was beginning to reconsider my choice of transportation methods, I was picked up by Lea, an exchange student from Colorado who was heading to Wanaka and would be able to take me to within about 30 miles of Queenstown. The ride went without a hitch (couldn’t resist..apologies); Lea was friendly, easy to talk to, and (to my relief) a safe driver, although our conversation did reveal that she was a Mac enthusiast but since she was the only person in two hours with the heart to pick me up, I decided to forgive her for this. After being dropped off in a little hamlet by the name of Cromwell, I had barely pulled my sign back out of my backpack when I was picked up by two local girls one of whom was heading to Queenstown for a job interview (I should note that all three girls who picked me up were rather attractive…apparently my conscious decision to shave prior to hitchhiking so as not to look like an axe murderer paid off 😉 ). They drove me the last half hour into Queenstown and gave me some tips on the best way to hitchhike back out of Queenstown (which I ended up not doing due to bad weather and time constraints), thus completing my short but successful hitching journey. Me on Queenstown Hill with the slightly humorous side of my sign that I never actually had to use. The hitchhiking community is divided on funny signs apparently. Some say they help, some say it makes you look desperate. I got where I needed to go with just a simple "QUEENSTOWN"
Queenstown itself is an interesting place. At any given time there are probably more tourists there than permanent residents here resulting in a very resort-ish and touristy, yet at the same time very upscale, feel. Most people come here to bungee jump, skydive, paraglide, jetboat, zip line, or to participate in a myriad of other adventurous activities in the area. In fact, for the entirely reasonable price of $189, you can even be strapped into a plastic lawn chair, tethered to a steel cable, and pushed off of a 500 foot high platform that is suspended over a rocky canyon as a video showed to me by an English girl in my hostel proved. My plans centered more on the…er…cheaper activities: namely, hiking. 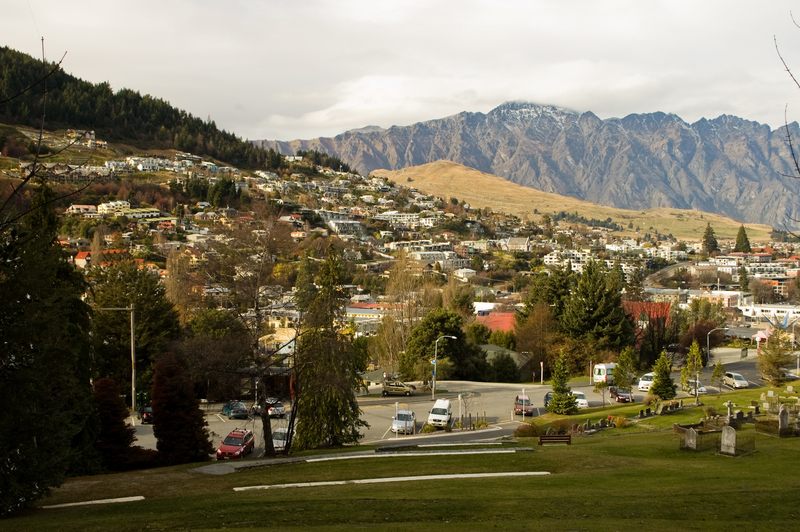 Queenstown is smack in the middle of the mountain chain that runs along the entire South Island of New Zealand and there are countless trails in and around the town. In the less than 48 hours that I was actually in Queenstown, I managed to get in almost 25 of hiking in breathtaking mountains surrounding the town. The marquee hike in the Queenstown area is the Ben Lomond Track, which ascends nearly 5,000 feet in a distance of only about 4 miles. I started this hike well before sunrise which made navigating the maze of approach trails on the lower slopes of the mountain rather interesting, but I managed to reach the summit by mid-morning. I’ve never been skydiving but I honestly don’t know how it can be that much different that what I saw from the summit of Ben Lomond. The views from the summit were undoubtedly some of the best I’ve seen in New Zealand, or anywhere else for that matter. It wasn’t even a particularly clear day and yet from my vantage point nearly one mile directly above Queenstown, I could see peaks that were hundreds of kilometers away. To the south was Lake Wakatipu, New Zealand’s longest lake, with Queenstown strung out in a band along its shore. To the north were the snow capped peaks of the Southern Alps, including Mount Aspiring, New’s Zealand’s second highest peak after Mt. Cook. My stay on the top was short however given extreme winds that prevented me from even standing up long enough to take more than a few pictures. Self portrait from the Ben Lomond Summit. It was crazy windy. My fully loaded backpack literally started rolling away in the wind at one point. In the evening, I explored Queenstown with some other friends who had ventured into the mountains for the weekend. Dinner was at the famous Fergburger (supposedly the best burgers in NZ) where I indulged in the enormous and absolutely delicious ‘”Tropical Swine”, a fresh NZ beef patty topped with cheese, bacon, pineapple, aioli, lettuce, tomatoes, onion, and tomato relish. I also lost a whopping $2 in a slot machine at a casino (gambling age in NZ is 20) and would have had photo evidence had the security guard not swooped in and politely informed us that photos were prohibited. All in all though, not a bad way to finish off my time in New Zealand. More wrap up stuff to come once I finish my last two finals and pack my bags for the trip home. Panorama from Ben Lomond Summit. Queenstown and Lake Wakatipu at left. This entry was posted on June 19, 2011 by Zach Schierl. It was filed under Hiking, New Zealand, Study Abroad and was tagged with Ben Lomond, hitchhiking, New Zealand, Queenstown.